We are at Day 7 of the 2014 Canadian Cyclist Christmas Gift Guide. Today we are recommending a book that every serious cyclist, club executive, team manager, event organizer and coach should keep as a reference: Every Cyclist's Guide to Canadian Law. 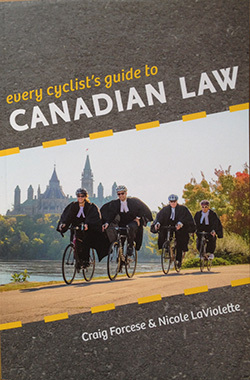 Just published, this 200-plus page book was written by two avid cyclists from Ottawa, who also happen to be law professors - Craig Forcese and Nicole LaViolette. I will say up front that this is not a light read - the footnotes at the end of each chapter run to multiple pages. However, it provides a comprehensive overview of the various aspects of Canadian law as they apply to cycling and cyclists. Everything from bike theft to accidents, to purchasing or selling a bike, warranties, running a club or racing, are covered in a clear and concise manner. The authors use simple day-to-day examples to illustrate situations and clearly lay out the scope and limitations of your rights and obligations. It will by no means turn you into a lawyer, but it will provide every cyclist with a better understanding of Canadian law as it pertains to cyclists. They even contribute a portion of the proceeds from sales to the Share the Road Coalition. Published by Irwin Law Inc.